“If you’re thinking of visiting Cape Town, make sure you call Sally. 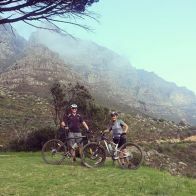 We organised a guided mountain bike tour of The Cape. She is a magnificent guide and a wondeful person. She is very knowledgeable and will literally organise whatever tour at whatever price you can afford. For us she organised a hike, followed by biking around the cape then it was off to sit on one of the many beaches to drink wine and watch the sun go down.Oh and her boyfriend is an Australian so she understands us :-).” – Simon Harris, Melbourne Australia Dec 2004.